If you’ve had problems with Annie’s Books Online loading slowly, here’s an option that will speed things up! Download the html files that make up the book, and run them from your desktop, using the same application (Explorer, Safari, Firefox, etc.) you would use to browse the internet. This works because a browser is an application for reading html and other online markup languages, and displaying the result in a form that makes sense to people. That’s usually a mix of text, photos, and possibly videos. The browser doesn’t care if the code is located on the web or on your desktop, just so you direct it to the proper starting address. Each of the Annie’s Books Online is a folder containing the html files, images, sounds, and movies that tell the story. For desktop use, I’ve made a ZIP file of each book’s folder for you to download. 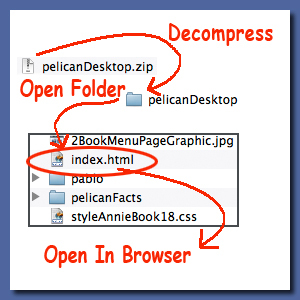 Once you have a copy of the zip file on your computer, here are the simple steps to use the book. 1. Decompress the downloaded zip file of the book to restore the book’s folder. It’s important NOT to move files within a book’s folder(s), but you can move, duplicate, and store the outer folder with its files and subfolders anywhere on the hard drive. 2. Open the outer folder, and locate a file called index.html. Open it with any browser. That’s it! Once you open index.html in a browser, you will see the book pages displayed exactly as they appear online. But they will load much faster since you don’t have to wait for each page to download from a distant location. Beginning in October 2015, new desktop books will be written in and this fact will be noted in the description. This new format will let sounds from buttons play, and will play the included videos (.m4v format), both without the need for an active internet connection. I’ll gradually be revising older books, also. Look for the notice in the book descriptions. desktop books play in modern browsers including Mac Safari 5.0 or later, iOS Safari 4.3 or later, Firefox Mac or Win v. 39 or later, Internet Explorer 9 or later, and Google Chrome Mac or Win v.12 or later. Note that iOS does NOT autoplay sounds, so watch for Play Sound buttons to hear the sounds that autoplay on other systems. Users of Windows XP with IE 8 or earlier will need to update their browsers to play the new desktop books. QuickTime is no longer supported on the web, but for older desktop books I have not yet revised, you could play the movies manually. However, there is no way to play sounds from buttons offline with these older desktop books. Here is the list of downloadable book files. You’ll also find a link to each book on its main activity page, at the end of the Online Links section. Books written in are marked and need no internet connection to play sounds and movies, but in iOS you must touch the Play Sound button (no sound autoplay in iOS). Application needed:Any Modern Web Browser. Animals Books link: animalsDesktop.zip (409.7 MB) What I Like Best About Animals and The Animals Game to read from the desktop using a modern web browser; written in so no internet connection is needed. For details on using Annie’s Books Online, click here. Bird Math link: countingBirdsDesktop.zip (15.9 MB) Bird Math activities to read from the desktop using a modern web browser; written in so no internet connection is needed. For details on using Annie’s Books Online, click here. Gingerbread House link: gingerbreadDesktop.zip (15.9 MB) Gingerbread House activity to read from the desktop using a web browser. For details on using Annie’s Books Online, click here. Holiday Tree link: holidayTreeDesktop.zip (26.7 MB) Holiday Tree activity to read from the desktop using a web browser. For details on using Annie’s Books Online, click here. Jack O’ Lantern link: jackOLanternDesktop.zip (5.5 MB) Jack O’ Lantern activity to read from the desktop using a web browser. Written in so no internet connection is needed, and sounds play on iPad®. For details on using Annie’s Books Online, click here. Jason books link: jasonDesktop.zip (24.1 MB) Jason’s String and ING Is A Powerful Thing books to read from the desktop using a modern web browser; written in so no internet connection is needed. For details on using Annie’s Books Online, click here. Little Toot link: tootDesktop.zip (17.1 MB) Little Toot book to read from the desktop using a web browser. Movies require QuickTime. For details on using Annie’s Books Online, click here. Log Cabin link: logCabinDesktop.zip (20 MB) Log Cabin and Fill The Shelves books to read from the desktop using a modern web browser; written in so no internet connection is needed and sounds play on iPad®. For details on using Annie’s Books Online, click here. Madagascar Adventures link: MadagascarAdventuresDesktop.zip (247.3MB) Five Madagascar Adventures to read from the desktop using a modern web browser; written in so no internet connection is needed and sounds play on iPad®. For details on using Annie’s Books Online, click here. Madagascar Lemurs link: madLemurDesktop.zip (39.9 MB) Lots Of Lemurs and Islands books to read from the desktop using a modern web browser; written in so no internet connection is needed and sounds play on iPad®. For details on using Annie’s Books Online, click here. Mayan Jungle Adventure link: mayanDesktop.zip (24.6 MB) Mayan Jungle Adventure and Fact Or Fiction books to read from the desktop using a web browser. Movies in Mayan Jungle Adventure require QuickTime. For details on using Annie’s Books Online, click here. Pablo Pelican link: pelicanDesktop.zip (23.3 MB) Pablo’s Bad Day and Pelican Facts books to read from the desktop using a modern web browser; written in so no internet connection is needed and sounds play on iPad®. For details on using Annie’s Books Online, click here. Pumpkin Pie link: pumpkinPieDesktop.zip (8.6 MB) Making A Pumpkin Pie activity to read from the desktop using a web browser. Movies require QuickTime. For details on using Annie’s Books Online, click here. Showertime! link: showertimeDesktop.zip Showertime! book to read from the desktop using a modern web browser; written in so no internet connection is needed and sounds play on iPad®. For details on using Annie’s Books Online, click here. Snow 2010 link: snowDesktop.zip (18.3 MB) Snow and Making A Snowman books to read from the desktop using a web browser. Movies require QuickTime. For details on using Annie’s Books Online, click here. Sofie Sea Lion link: seaLionDesktop.zip (41.4 MB) Sofie’s Adventure and Sea Lion Facts books to read from the desktop using a modern web browser; written in so no internet connection is needed and sounds play on iPad®. For details on using Annie’s Books Online, click here. The Haunted Castle link: HauntedCastleDesktop.zip (13.4 MB) The Haunted Castle interactive book to read from the desktop using a web browser. For details on using Annie’s Books Online, click here. Tidepools link: tidePoolsDesktop (41.2 MB) Three TidePools books to read from the desktop using a web browser. Movies require QuickTime. For details on using Annie’s Books Online, click here. Visiting A Petting Farm link: pettingFarmDesktop.zip (16.3 MB) Visiting A Petting Farm activity to read from the desktop using a web browser. Movies require QuickTime. For details on using Annie’s Books Online, click here.